Reducing the burden of waiting in transit travel is critical to increasing the attractiveness of public transportation. Waiting time perceptions are highly subjective and vary according to mode, availability of schedule information, and stop amenities. The research on pedestrian design finds that high-quality and natural environments reduce stress and encourage walking and bicycling. It seems reasonable that similar effects would apply for transit users on the basis of the environments around transit stops, but little research directly explores the issue. This paper responds to this knowledge gap by examining how perceptions of waiting time vary in relation to stop environments. The research compared transit users’ actual and estimated wait time at 36 stops and stations in a mix of environmental situations in the region of the Twin Cities, Minnesota. 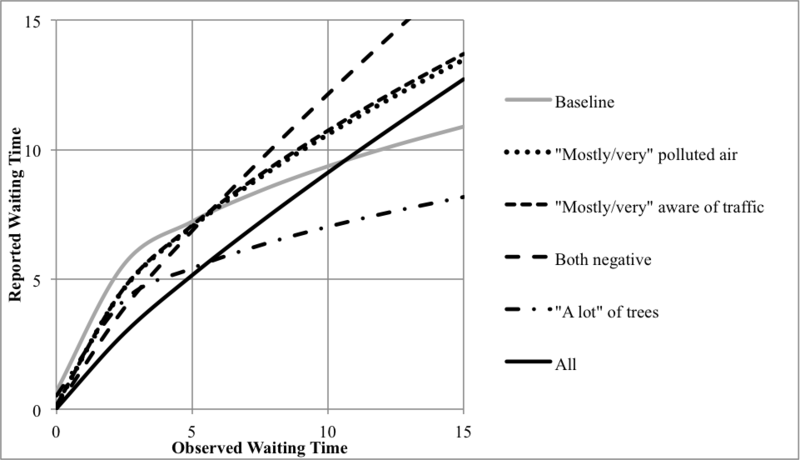 Regression analysis explained the variation in riders’ self-reported wait- ing time as a function of their externally observed waiting times as well as characteristics of the environment surrounding the stop and station. For waits longer than 5 min, perceptible pollution and exposure to traffic led to significant overestimates of waiting time. Riders waiting at stops with dense, mature tree cover, however, significantly underestimated their waiting times. The effect of dense, mature tree cover is strong enough to compensate for the effects of both air pollution and traffic awareness. Policy implications and further research needs are discussed.